In LEGO Minifigures Online, players can team up to complete quests and dungeons in five themed worlds. Funcom has announced the launch of LEGO Minifigures Online on iOS and select Android devices. The online adventure game sees gamers exploring multiple environments while completing quests as over one hundred different LEGO Minifigures (characters). 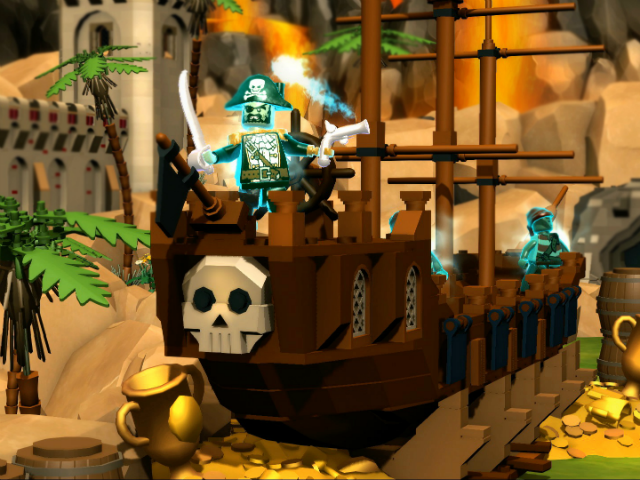 In LEGO Minifigures Online, players begin in Pirate World, and will complete main and secondary quests and dungeons as the story unfolds. In typical LEGO game fashion, gamers can destroy items in the environment to earn stars, the game’s currency. Each Minifigure has different abilities and powers, including a base attack and a secondary power which may cause damage to multiple enemies at once. As players complete quests, they’ll eventually travel to four other worlds: Space World, Mythology World, Dino World and Medieval World. Each contains appropriately themed content and enemies; for instance, Mythology World will eventually see players completing a dungeon to defeat Hades. While some of the game’s themes may sound mature, they’re presented in a family-friendly fashion, with a focus on humor. In addition, as a multiplayer experience, the game is kid-safe, offering moderated chat and pre-screened usernames (so kids can’t use their real names). While gamers can explore dungeons and complete quests by themselves, the game encourages cooperation between players, with its cross-platform functionality allowing players to team up with others on PC or Mac (or simply access their progress on multiple devices). LEGO Minifigures Online connects to the real-world Minifigures which are available to purchase in stores. When players purchase a compatible figure, they’ll receive a code which can be redeemed in the game to unlock that figure for play. Each Minifigure can be upgraded via a character-specific skill tree, using the stars collected while exploring. Players will also receive plenty of in-game Minifigures for free while playing. Users can equip their favorites to one of three spots on their team, and swap between these instantly while playing. LEGO Minifigures Online is designed for LEGO fans of all ages; for those who love online games, and those who have never played one before. To make it even easier for friends to play together, the game is playable seamlessly on a large number of platforms and devices, and everyone plays together in the same online world. No matter whether you are playing on a smartphone, tablet or desktop, you will all be playing the same game—together. LEGO Minifigures Online is available to download for $4.99 on the iTunes App Store and Google Play. This base purchase includes the first world, with additional worlds available to purchase for $3.99 each. These new worlds are available to purchase now on iOS, and will roll out to Android users later this summer. The PC and Mac version of the game is available to purchase on the game’s website or Steam (including Linux) for $29.99, and contains all of the game’s content.